This article originally appeared on the EOS Worldwide blog on June 25, 2018. One of the first things an EOS Implementer™ does when working with clients is to determine the right structure for the organization using the Accountability Chart. While this can be a straightforward exercise for your senior leadership team, some of your team members may have difficulty when it’s time to build out the Accountability Chart for their own departments. Here are a few tips to help you navigate this process with your team. 1. Set a due date for each department to submit a first draft. Start by going through the process with each team member to make sure they understand that they need to focus on structure first – not people. Some will present you with the right information in an organized manner. Others might not fully grasp the concept right away and will simply provide you with a list of names. You may need to sit with them to help them diagram the right structure for their department and to help them identify the five roles for each seat. The ideal structure you would design for your business in a perfect world may be vastly different from the realities that are before you. You may have someone who is really good at something that may not be what their position requires. You may have one individual who doesn’t get along with the person who should be his boss and reports to someone else. You may have an employee who is a great, dependable person, but whose skills aren’t really suited to any of the seats on your chart. If your company is going to move forward, situations like these cannot continue. Designing a structure that is best for the long-term welfare of the company is more important to achieving your vision than avoiding hurt feelings or personality conflicts. You can’t build your Accountability Chart with the idea that you must have a seat for everyone who is currently on your team. Define the structure based on how your business should work, then make a list of the people issues you have, and figure out a plan to deal with them. This happens often! If a person is performing the duties of a particular seat, their name needs to be on that seat. It is better to have their name in multiple seats than to change their job description to fit the combination of responsibilities they have now. The business will grow to a point where they can no longer perform the duties of multiple positions. When you reach that milestone, the person filling multiple seats can assume just one of them and you can hire or elevate someone else to fill the other seats. To learn more about how to navigate this transition, read this great blog by Sue Hawkes, Are You in Too Many Seats? 4. Collaborate and make revisions until you get it right. 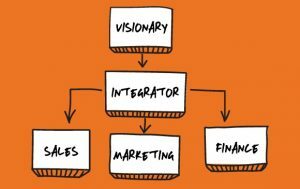 In general, the Integrator should drive this process. Put it on your issues list to discuss your team’s progress every week in the IDS™ portion of your Level 10 Meeting™, and consider scheduling offline meetings outside of the Level 10 if needed. You will go through multiple versions (one client had 18!) before it is settled and ready for rollout. Continue to talk it out until you arrive at the best structure. If you’re working with an EOS Implementer, you’ll go over the chart during your Vision Building™ sessions, and he or she can help you resolve any details you might need assistance with. Keep the discussion and revisions going until you hear the sweet sound of agreement around the table. 5. Live with it and be prepared for it to evolve over time. Remember: your structure will need to change over time as your company grows. The structure your company needs now is different than when you started out, and your needs will change as you grow. Make sure you review your Accountability Chart regularly, making adjustments as needed to support your current needs and prepare for future growth. Watch this video to learn how to develop your company Accountability Chart.